19th annual meeting in Montreal on MRI. Prior to this I also attended 8 of the 10 SMRM meetings (which were replaced by the ISMRM). In all, this is the 27th meeting on MRI I have watched in my career. Over the past several years, it has become increasingly obvious that the best MRI studies are done on MRI scanners with a field strength of 3T. It really is twice as good! For detection of breast cancer ONLY 3T MRI was shown to 100% sensitive in a study supported by the American College of Radiology. is critical in the evaluation of patients prior to surgery. Breast MRI offers valuable information about several breast conditions that cannot be obtained by other imaging modalities, such as mammography or ultrasound. As a result, it is being used more and more for the preoperative evaluation of patients with newly diagnosed breast cancer. included 164 women with biopsy-proven breast cancer. Researchers analyzed how breast MRI influenced the management of surgical choices of those patients. “32 of 164 (20%) patients, had a change in treatment” said Valeria Dominelli, MD. “Breast MRI also detected 51 (33%) additional suspicious lesions not seen on mammography or ultrasound,” said Dominelli. (A study done here in the U.S. had similar findings). Breast cancer growth in a BRCA patient over 1 year. Surgical biopsy found the tumor to be benign. Follow-up imaging was only done after the mass had grown significantly. and should be recommended for mapping tumor extent in patients with newly diagnosed breast cancer. Sadly, this advice is not being heeded by the surgeons here in the U.S. The correct assessment of the disease can help the surgeon plan the most appropriate surgical treatment, possibly reducing the need for re-intervention. I recently saw a case where the surgeon biopsied 5 times and still did not get all the tumor! Breast MRI was only done after the 5th biopsy attempt. The patient finally had a mastectomy. SIX SURGERIES. It is well known that 3T MRI is better than 1.5T MRI at finding and diagnosing breast cancer. 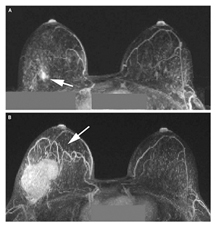 (See: www.3tbreastmri.com). In fact, research shows that only 3T MRI that is 100% sensitive for breast cancer. 1.5T MRI is said to have a sensitivity rating of approx 90%. For the same price, why not be sure? One other advantage of insisting on having a 3T MRI is that not only are the images sharper because of the extra resolution, it takes less time to take them! Stronger is clearer. Stronger is faster. Think of your digital camera; it makes sense. MRI Consultants offers the best technology in MRI in Delaware. Even our “open” MRI is an 18-channel 1.5T MRI scanner! We prefer to do Breast MRI on our 3T because of the extraordinary sensitivity to Breast Cancer, but for someone who either cannot fit, or who is extremely claustrophobic, our 18-channel 1.5T OPEN BORE MRI is a good alternative. And for those who are highly claustrophobic, IV sedation is available at no additional charge. When getting an MRI (especially a Breast MRI), be sure to get a CD with the MRI study on it. In addition to it being your legal right, it also makes a great deal of sense. Should you need to have a follow-up study, you can bring the CD with you for comparison by the radiologist performing the second test. A recent study from Brown University suggests that the false positive rate drops on repeat MRI studies. IONIZING RADIATION is a matter of great concern nowadays. no matter how many you have done. CT scans blast you with x-rays. In some cases the CT scans can expose a patient to amounts of radiation that are greater than that received by workers at the Fukushima nuclear plant! And, CT scanners do not always deliver predictable amounts of radiation. There was a recent finding by the FDA that some scanners inexplicably deliver up to 20 times the ordinary dose of x-rays. In these patients in California, the radiation dose was so high that the patients actually lost hair and might get early cataracts from a CTA (computerized axial tomography angiogram and perfusion study.) In most cases a CT study can be replaced by a 3T MRI study. Most physicians and patients are unaware of the huge dose of radiation that each CT scan delivers. Always ask if there is a different test available that will get the information needed without exposing you to radiation. More information on this and other MRI-related issues, check our websites: www.mriconsultants.net www.bestopenmri.net. For people who are without insurance, we offer a low Out-of-Pocket discount. We try to make your MRI experience as low-stress as possible. Ask questions. Get the best. Our newest 3T MRI scanner will be coming to Lewes in Fall 2011. This is a 32 channel Philips 3T Achieva with a 32-channel head coil. It will be one of only 4 such scanner in the U.S.
← Previous Story Bare Essentials Is A Bra Fitting Boutique For The Modern Woman!! !